One thing I am constantly asked is how to incorporate left over ingredients from other recipes into a new recipe so that the leftover ingredients don’t go to waste. Being such a budget conscience person myself, this is something I am constantly aware of and try to do in my own kitchen. Many people are surprised to learn than many things, nuts, cooked pasta, sauces, fruits, veggies, cooked meat, cookie dough, etc. can be frozen for a period of time. This is one way to keep leftover ingredients for a little bit of time until you can use it again. However, to ensure freshness of ingredients, I try and use them up quickly. This may require some creative thinking to use the ingredients in a different way than what I originally purchased them for, so that we are not eating the same thing like five times in one week. Take the recipe for Mexican Street Corn from Monday. Depending on how many ears of that incredible corn I can eat in one sitting, I might have corn, limes, cilantro and queso fresco leftover. What to do with all those ingredients? 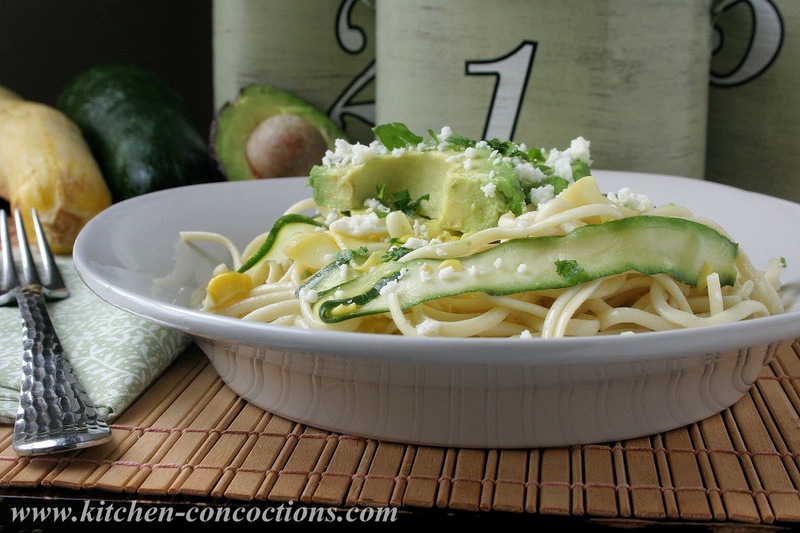 Make this Summer Squash Ribbon Pasta Salad with Sweet Corn & Avocado, of course!! This pasta salad just screams summer eat me! Using fresh summer produce with a light chili lime vinaigrette, this salad could be a refreshing meatless meal or the perfect side to bring to a summer picnic. What are your tips for using left over ingredients? 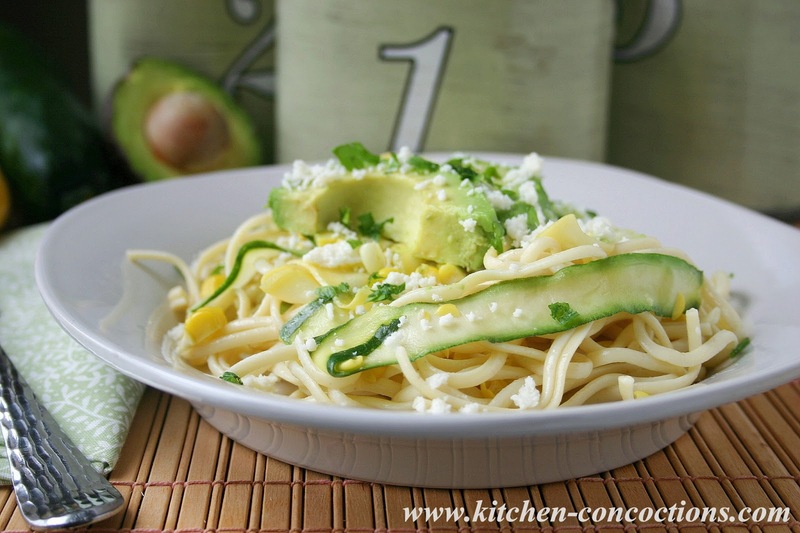 In a medium sized bowl, whisk together the olive oil, cilantro, lime juice and zest. Season with chili powder, salt and pepper, to taste. Set aside. Trim the ends of the zucchini and yellow squash. With a vegetable peeler, shave lengthwise into long, wide strips about 1/16 inch thick. When you get to the center of the zucchini, turn the squash over and peel from the other side until you get to the center again. Bring a large pot of water to a boil. Add pasta and boil uncovered for 9-10 minutes, or until desired tenderness. 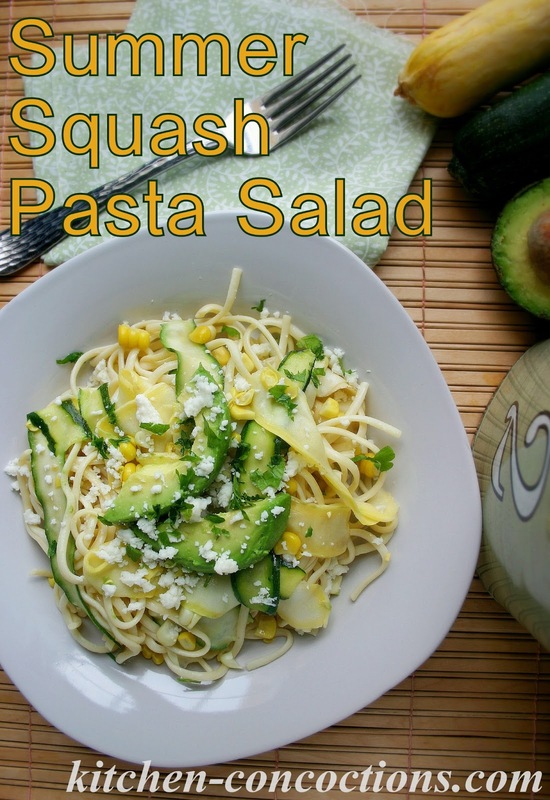 During the last 2-3 minutes of cooking, add summer squash ‘ribbons.’ Drain and place pasta and squash in a large bowl. Cutting close to the cob, cut the corn corn kernels off of the cob. Discard cobs. 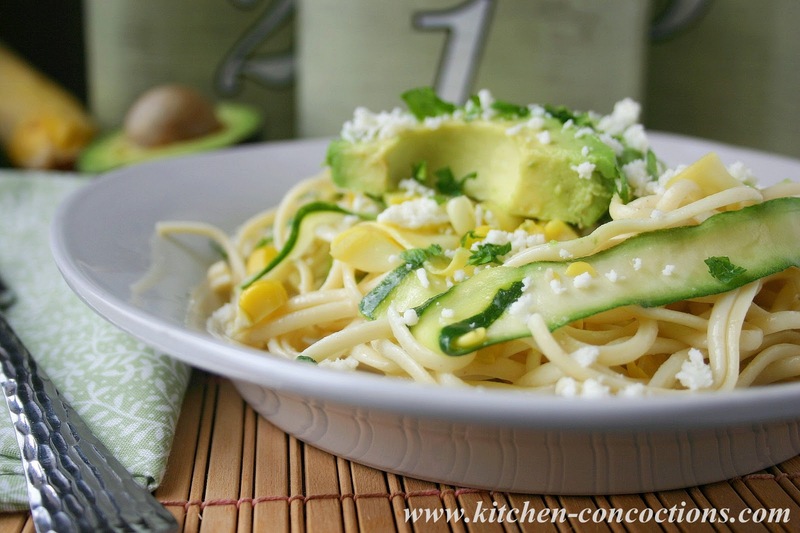 Add corn and avocado slices to the squash/pasta mixture. Pour olive oil and lime dressing over salad and toss until coated. Crumble cheese over the top of the salad and season with additional salt and pepper, if needed. Serve warm, at room temperature or chilled.